A fair or “faire” or “fayre” according to Wikipedia is “a gathering of people for a variety of entertainment or commercial activities. It is normally of the essence of a fair that it is temporary with scheduled times lasting from an afternoon to several weeks.” Some trace the beginnings of the “fair” to the Biblical account found in Ezekiel: “Tarshish was thy merchant by reason of the multitude of the kinds of riches with silver, iron, tin and lead, they traded in thy fairs.” Ezekiel’s account of the destruction of Tyre, supposedly written about 588 BC, describes Tyre as an important market and fair center. The Community Fair Day at Pine Mountain has its origins in what appears to be ancient European traditions as well as more contemporary ideas. The street fairs of Europe with their balladeers, minstrels and plays find many echoes in the early Pine Mountain events. Later celebrations seem closer to the agricultural fair where animals and produce were displayed and judged for quality. I don’t know whether I dare enclose a list of premiums for our fair or not and ask if you will help in the cause. Probably you know that Columbus Creech and I are getting it up — first. Harlan County Fair [to?] to be held here last Saturday in September. Two professors of agriculture are coming from Ky. State University to be judges and speak. We hope for a big day. so far l have about $40 raised for premiums. Mr. McCullough sent $25. Wasn’t that lovely? It certainly cheered my heart. The people are most enthusiastic, all planning on what they can enter. Our children are bringing things too. Any help will be most welcome! Our fair [Fair Day] is this Saturday. Mr. Roettinger [Philip Roettinger, lawyer and Board of Trustee member] is coming for it. I have the work in the hands of five committees so I feel quite free. Three men (Mr. R, two professors from state university) and nine women are expected — from Berea, Lexington, St. Louis — where not! The fair was a great success — was perfect day. Several hundred people. About 9 o’clock people began riding in with saddle bags or pokes stuffed with apples, parsnips, beets, corn, canned goods, etc. I guess Mr. Roettinger will tell you about it. He certainly was lovely! When I get home I’ll tell you all about it, for if I get started now will go on forever. Friday was a hard day for dozens of things were to be finished for fair, found for ten guests (Berea, State University and Mr. Roettinger, etc.) All day I never sat down except at meals. After supper, I showed Mr. R. [Roettinger] Laurel House and then took him over to Miss Pettit’s. Just as I got back girls came to me and said they heard someone calling from top of mountain. First secretary from here, now at Berea, with two friends got lost trying to come over by way of Jack’s Gap. It was then 6:30, pitch dark, but Lorraine, nicest big girl ever, and I started right up the mountain after them, with flash and lanterns. Mr. Zande soon overtook us and we did have an exciting climb. For about an hour and fifteen minutes we climbed up and up, over cliffs and more cliffs. Mr. Z. said grade was from 85 to 90%. All the time of course we called to them for directions, they to us, and E. deL [Ethel de Long]. from below called to both crowds. Their voices seemed miles off, the cliff cut off the sound so. They had given up all hopes of anyone reaching them and planned to spend night on [the] mountain. We knew they could never get down the way we went up, so followed mt. along top of Jack’s Gap and then down trail and home reaching here at eleven. It was a lovely moonlight night. We liked it a lot, but the other three had been walking since 11:30 in the morning and were all in. When we got home, fixed supper, took guests to Open House, it was 12 when Lorraine and I started upstairs to bed. The next day was Fair. At 5:30 was up and day went off beautifully. That night Aunt Sal invited Mr. R.[eoettinger], three Berea people and me to supper — sent word asking me to come early and “help fix.” It was a spread – gritted bread, fall beans. roasting ears and butter. Following the fair at Pine Mountain, Marguerite was invited to accompany Katherine Pettit to HIndman, Kentucky, where Katherine was to be a judge at the Hyden fair. Marguerite was invited along so she could observe and learn from another fair setting. This suggests that Hyden and possibly other small towns had already instituted fairs much earlier than Pine Mountain and that they may have been a model for many of the activities that were later adopted at Pine Mountain. Miss Pettit and I start for Hyden, county seat of Leslie County, to be gone almost a week. I may be back late Monday night, October 15. but most likely not until the 16th. Miss Pettit asked me to go way last summer. She’s to be one of the judges for the fair and since I have charge of fair again next year think it will help me a lot. I am going on “Bobby” with luggage, KP [Katherine Pettit] walking. 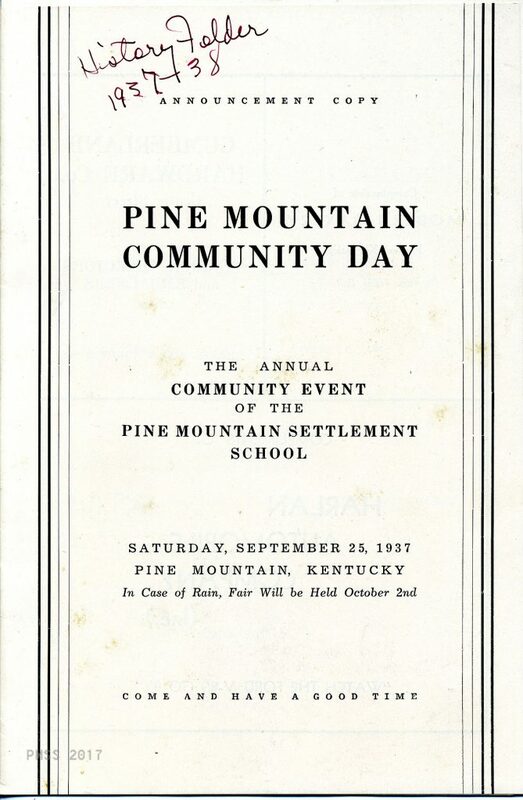 Another early mention of the Community Fair Day is found in the 1920 Pine Mountain Settlement School Catalog. It suggests that the annual event had been made an official event at the school and had been in place for least several years. Its papers of incorporation give the School entire freedom in this large field of rural service. The Board of Trustees, an independent organization composed of men and women in different parts of the country, desires the School to co-operate in every way with the community, to help solve the problem of wholesome social diversions and to share in the religious life of the community by Sunday School work and non-sectarian Christian association. So it is that on all the great days of the year the School’s grounds are the gathering place for the people of the surrounding country. There is the Community Christmas Tree, the Fourth of July Celebration, the Community Fair, and the weekly parties for the young people of the neighborhood. As indicated by this and many more accounts the Community Fair Day is one among many annual events established at the School by the early 1920s. Begun as part of a broad community outreach, Fair Day has been part of the celebration of harvest in the Fall of the year from near the founding of the School. Abner Boggs, a long-time native of the Pine Mountain valley captures the essence of the celebration in 1944 as recorded in the edition of the Pine Mountain Settlement School Notes, some twenty-plus years after the catalog entry. “Hit’s always right and good for men folks and womenfolks to have conversation one with another. On this day they were things to eat and folks to eat ‘em. They were interestin’ things to look at and folks looked. They were a fine educated man to speak, and I reckon most folks got some benefit out of hit. Them that done the best in any manner of means such as callin’ a hog or raising a turnip got notice took of hit. They weren’t no discord nor willful killin’ and shootin’ to interrupt. Hit were a good Fair.” . . . It is obvious that the scale and scope of the Community Fair varied little from year to year. The extent of the event has, however, waxed and waned in both the School and in the Community as events such as the two world wars intervened and as the School administration changed and personnel departed and arrived. Before the development of good roads, the event was a local celebration, but as roads improved the reputation and attendance of the Fair Day grew and included many surrounding communities from Harlan, Letcher, Leslie, Perry and Bell counties. 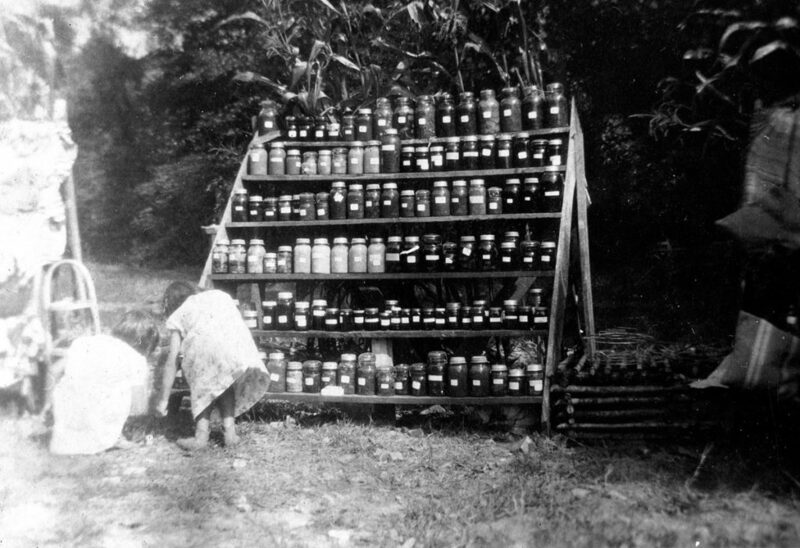 Today, with the increased interest in farming and foodways there is a renewed interest in Fairs, and many communities throughout Appalachia are gathering to celebrate their home-grown produce, share their talents as basket weavers, potters, weavers of “kivers,” jelly-makers, chow-chow champions, furniture makers, whittlers and gee-haw whimmy diddle diddlers. The memory of the Pine Mountain Community Fair has been passed down through generations in the families of the Pine Mountain valley and it is doubtful that the community will soon let go of this important Fall tradition. The hog-calling and chicken calling and other early activities may have gone away but the fair has tapped into what the local community now finds of interest and, who knows, maybe we will hear some of those animal calls again….. maybe this time an elk call or a turkey call, or even a coyote call. The Guide to Pine Mountain Community Fair Days follows the celebration as it was interpreted across the years at the School. Not all years have a Fair record, but the events varied very little. The years represented in the guide are not reflective of all the years that the Community Fair was celebrated at the School.